Award-winning blogger Jill Winger and her family pursue modern-homesteading on the wide-open prairies of Wyoming. In her debut cookbook, she shares 100+ delicious recipes that bring these flavors and this spirit to any kitchen table. You don’t have to grow all—or even any—of your own food to cook and eat like a homesteader. Jill teaches people how to make delicious traditional American comfort food recipes with whole ingredients. She includes bonus recipes for staples that many people are surprised to learn you can make yourself. 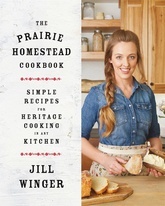 Beyond that, The Prairie Homestead Cookbook shares the tools and tips Jill has learned from life on the homestead, like how to churn your own butter and experience all the fulfilling satisfaction of a DIY lifestyle.